A regular breeding resident and migrant, the Common Gallinule was a rare species during the Minnesota Breeding Bird Atlas (MNBBA). Although the Common Gallinule is present in very small numbers throughout the eastern United States, it has a localized distribution. Larger populations are scattered across the lower Great Lakes region of the United States and Canada, portions of New England and the Maritime Provinces, and portions of the southeastern United States. It also occurs further south in the Caribbean, Central America, and South America. Regardless of its broad distribution, in North America the gallinule only reaches high densities along the coastal waters of the southeastern United States (Figure 1). Ranked a species of Moderate Concern by the North American Waterbird Conservation Plan and assigned a Continental Concern Score of 10/20 by Partners in Flight. The Common Gallinule is officially classified as a Special Concern Species in Minnesota and has been designated a Species in Greatest Conservation Need by the Minnesota Department of Natural Resources. Throughout much of North America, the Common Gallinule is a short- to medium-distance migrant that winters in the southeastern United States. Most populations along the Gulf Coast of the United States and farther south are year-round residents. Gleans food from the water surface and occasionally dives, feeding on the seeds and roots of aquatic vegetation and on small invertebrates. A platform anchored to stems of emergent vegetation with a ramp leading down to the water’s surface; multiple nests are often constructed and may be used for resting by the adults and young broods. Breeding distribution and relative abundance of the Common Gallinule in North America based on the federal Breeding Bird Survey, 2011–2015 (Sauer et al. 2017). It was no uncommon thing for ten or a dozen to be visible at the same time. . . . Their hen-like cackling, interspersed with loud, often shrill, cries usually kept up all through the night. Now and then something would happen to disturb the peace of the whole Gallinule community and the deafening clamor that ensued spread throughout the vast slough, revealing the great number of birds present. At the time, however, nesting records only were available from Heron Lake in Jackson County (multiple nests in June 1919), Lake Shetek in Murray County (downy young), and Hennepin County (multiple reports of nests with eggs or recently hatched young). In addition, a nest was reported near Parker’s Prairie in Otter Tail County in 1903, but it lacked confirmation. The absence of any accounts in the Red River valley, west of Otter Tail County, calls into question Hatch’s assertion that the species was common in that area. In subsequent years, nearly all reports of nesting pairs came from the southern half of the state until, in July of 1947, five young gallinules were observed in Pope County (Chambers 1947). Then, between the summers of 1964 and 1966, there were four reports of gallinules in the northern regions of the state: at the Agassiz National Wildlife Refuge in Marshall County in early August 1964 (Ellis 1965), in Stevens County in mid-May 1965 (Strubbe 1965), in Duluth in early May 1966 (Green 1966), and in the Mud Goose Wildlife Management Area in Cass County in mid-July 1966 (Egeland 1966). When Green and Janssen (1975) provided an updated account of the species, they also described it as occurring primarily in the southern regions of the state. Nevertheless, noting several of the recent records summarized above, they suggested that it might actually breed much further north. A few years later, however, Janssen (1987) reassessed the species’ status and concluded that numbers had significantly declined in recent years. The Common Gallinule was now restricted largely to the southeastern region of the state, from the Twin Cities metropolitan area south through the backwater marshes of the Mississippi River and its tributaries. Outside of this core region, sporadic reports continued from central Minnesota (Kandiyohi, Stearns, Todd, and Watonwan Counties) and as far north as Marshall County in the west and Aitkin County in the east. Since 1970, however, breeding had only been confirmed in 9 counties: Anoka, Brown, Chisago, Hennepin, Houston, Ramsey, Sherburne, Stearns, and Washington. Hertzel and Janssen (1998) later published a modified map of counties with breeding records, deleting Chisago County from Janssen’s 1987 map and adding Morrison County. Since the Minnesota Biological Survey began its survey work in the early 1990s, the Common Gallinule appears to have become even rarer. Only 15 breeding season locations have been documented. The vast majority was reported from the Mississippi River valley from Wabasha County southward; the only northern record was from western Becker County (Minnesota Department of Natural Resources 2016). During the MNBBA, the Common Gallinule was only reported a total of 35 times from 12 surveyed atlas blocks and 4 priority blocks. Breeding was confirmed in 7 blocks (Figures 2 and 3; Table 1). The species was restricted entirely to the southeastern quarter of the state, from Sherburne County west as far as McLeod, Sibley, Nicollet, and Blue Earth Counties and east to the Mississippi River. The species was reported in only 10 of Minnesota’s 87 counties and breeding was confirmed in 7 counties. Of these 7, 5 were new to the list published by Hertzel and Janssen (1998): Blue Earth, Dakota, McLeod, Nicollet, and Wabasha. Although the number of reports is limited, the MNBBA seems a fair representation of the species’ current breeding range. Finding secretive marsh birds is challenging; finding rare secretive marsh birds is particularly difficult. There may be a limited number of pairs nesting in suitable habitats elsewhere in the state, but the core of the Common Gallinule’s range in Minnesota is limited to east-central, south-central, and southeastern Minnesota. During the twentieth century, the Common Gallinule gradually expanded its North American breeding range to the north and west. Reports from the Maritime Provinces in Canada, for example, were first documented in the 1960s, and reports from New Mexico were first documented in the late 1920s (Bannor and Kiviat 2002). Perhaps the reports in northern Minnesota in the mid-1960s corresponded with the northward range expansion documented elsewhere within the species’ breeding range. The retraction observed in Minnesota since the late twentieth century also has been observed in Ontario, where the gallinule nearly disappeared from the most northern portion of its range (Cadman et al. 2007). Elsewhere, local range contractions have largely been attributed to the loss of wetland habitat. Breeding distribution of the Common Gallinule in Minnesota based on the Breeding Bird Atlas (2009 – 2013). Summary statistics of observations by breeding status category for the Common Gallinule in Minnesota based on all blocks (each 5 km x 5 km) surveyed during the Breeding Bird Atlas (2009-2013). Summary statistics for the Common Gallinule observations by breeding status category for all blocks and priority blocks (each 5 km x 5 km) surveyed during the Minnesota Breeding Bird Atlas (2009-2013). Deep, permanent wetland basins are the Common Gallinule’s preferred habitat. Hemi-marshes that contain dense stands of emergents interspersed with open water provide the best conditions (Figure 4). Other important features include a dense cover of duckweed; floating mats of organic material that are used for preening, courtship and resting; and muskrat lodges and runways. Water depths of 15–20 cm are preferred (Bannor and Kiviat 2002). Often found occupying wetlands on the fringe of urban areas, the Common Gallinule does make use of smaller marshes, which may be altered and polluted. Invasive wetland plants, including hybrid cattails and purple loosestrife, are increasingly prevalent in the species’ nesting marshes, although its impact on habitat selection and reproductive success is largely unknown in the northern region of the Common Gallinule’s distribution. In Florida, the Common Gallinule is common in lakes dominated by the invasive plant, the water hyacinth (Bannor and Kiviat 2002). Typical breeding habitat of the Common Gallinule in Minnesota (©Lee A. Pfannmuller). Although the federal Breeding Bird Survey (BBS) is poorly designed to effectively monitor marsh-nesting birds like the Common Gallinule, it is the only range-wide data source available for the species. These data were used to extrapolate an estimate of 1.3 million birds for the North American population (Wires et al. 2010). No statewide estimate is available. Minnesota is on the northern periphery of the species’ breeding range; the core of the gallinule’s distribution in North America is along the Gulf Coast (Figure 1). In Minnesota the Common Gallinule has only been reported four times on BBS routes in the state, one each in four different years from 1966 to 2015. This compares to an average of 2 detections per route each year in Florida and Louisiana (Figure 1). Although not entirely reliable for secretive marsh birds like the Common Gallinule due to the species’ low relative abundance, the survey-wide BBS data suggest a significant average decline of 1.48% per year since 1966 throughout the Common Gallinule’s North American breeding range (Sauer et al. 2017). The only other source of long-term population data pertaining to the species’ status in its northern range is the Great Lakes Marsh Monitoring Program. Begun in 1995, this binational program surveys marsh birds and frogs at more than 5,000 locations in the Great Lakes Basin. 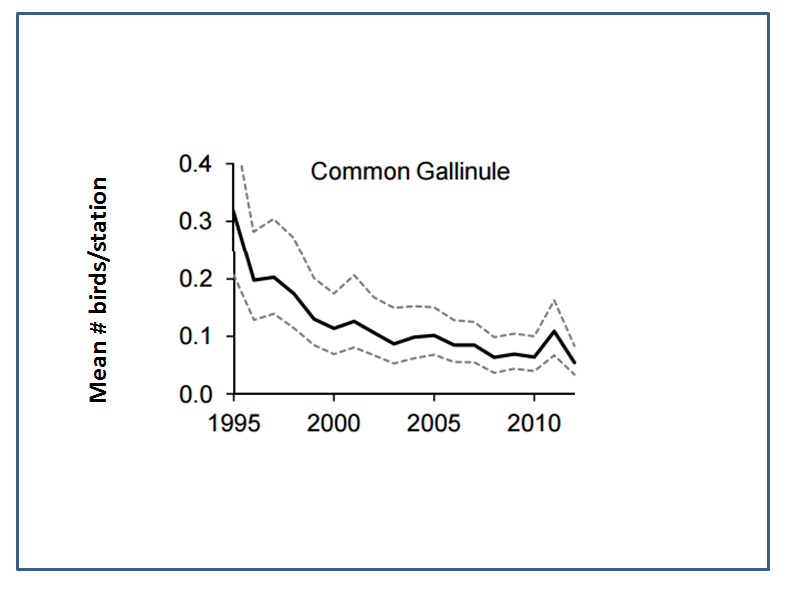 The data show a significant decline in Common Gallinule numbers from 1995 to 2012, with an average decrease of 7.5% per year (Figure 5). Like all wetland-dependent species, the fate of the Common Gallinule is directly tied to the loss and degradation of wetlands, at least on the northern periphery of its range. Populations further south appear to have adapted to more modified landscapes, including reservoirs and sewage treatment ponds (Bannor and Kiviat 2002). Common Gallinule abundance in the Great Lakes Marsh Monitoring Program, 1995–2012 (Tozer 2013). Despite apparent declines in the Common Gallinule’s abundance, little focus has been given to the conservation needs of this species. The North American Waterbird Conservation Plan (2006) ranked the species as one of Moderate Concern, as did the Upper Mississippi Valley/Great Lakes Waterbird Conservation Plan (Wires et al. 2010). It has been assigned a moderate Continental Concern Score of 10/20 by Partners in Flight (2017). In light of its rarity and declining abundance, Minnesota officially listed the Common Gallinule as a Special Concern Species in 1984 (Coffin and Pfannmuller 1988); it also has been designated a Species in Greatest Conservation Need by the Minnesota Department of Natural Resources (2015). The Common Gallinule is a harvested species in 31 states, including Minnesota (Bannor and Kiviat 2002). It is nearly impossible, however, to ascertain the level of harvest. No doubt this rare species is rarely harvested in Minnesota. Nevertheless, many states, including Minnesota, simply report the collective harvest of all rail species and do not itemize the harvest per species. In the South, many states separate the harvest of rails from gallinules but then lump the harvest of the Common Gallinule in with the Purple Gallinule, which occurs in the southern coastal states from South Carolina west to the Gulf Coast of Texas. The lack of information makes it challenging to accurately assess the impact of harvesting on Common Gallinule populations. At least one research biologist who studied the species for many years suggested that hunting pressure may indeed be too high (Greij 1994). Few specific management recommendations are available for this species apart from the necessary protection, restoration, and management of wetland habitats statewide. In addition, little is known about the potential impact of climate change on the gallinule. An initial report by the North American Bird Conservation Initiative (2010) ranked the species’ vulnerability to warming temperatures as low. Because the Common Gallinule is largely restricted to southern Minnesota, focused attention on riparian management in the region’s major watersheds is critically important to ensure that this rare and seldom-seen wetland inhabitant remains part of Minnesota’s natural heritage. Chambers, Amy. 1947. “Minnesota Nesting Records, 1947.” Loon 19: 90–95. Egeland, Paul. 1966. “Common Gallinule Near Grand Rapids.” Loon 38: 109. Ellis, John H. 1965. “Common Gallinule at Agassiz Refuge.” Loon 37: 83. Green, Janet C. 1966. “First Common Gallinule Record for Northeastern Minnesota.” Loon 38: 72. Greij, Eldon D. 1994. “Common Moorhen.” In Migratory Shore and Upland Game Bird Management in North America, edited by Thomas C. Tacha and Clait E. Braun, 144–157. Lawrence, KS: Allen Press. Strubbe, Ernest H. 1965. “Common Gallinule Record for Stevens County.” Loon 37: 106.